It's a convertible garment I’ve invented. It can be worn anytime, anywhere - in hot or cold weather, day or evening, fat day or skinny day. Depending on where I'm going or what I'm doing, I wear it as a tunic or dress - long sleeved, short sleeved, or bell sleeved. 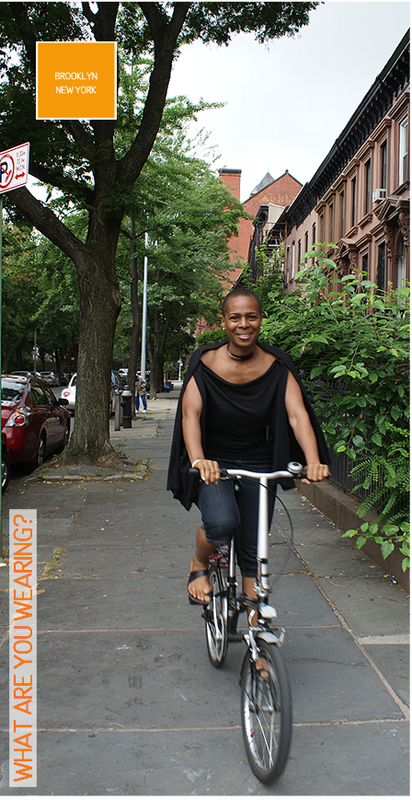 I can also go sleeveless, backless or strapless when I need to. It's versatile, size friendly and customizable to any body type. How did you come up with the idea for the Kimono Dragon? It just seemed to make more sense. If our bodies, the weather and our activities are changing all the time, shouldn't our clothes be able to respond to that cycle? I wanted stylish, flattering and low maintenance clothing that I could easily customize for my lifestyle needs and individual body shape – including my monthly and seasonal weight fluctuations. I always feel comfortable, confident and chic when I'm wearing a Kimono Dragon – even when I'm carrying a few extra pounds. Absolutely. As a child growing up in Jamaica, I designed my own clothing for special occasions, and my mom would take me to a dressmaker to get them made. I wasn't into sewing, but I was very into 3d puzzles and games. In terms of career, I wanted to be an artist-engineer like Leonardo Da Vinci. My dad suggested I find a way to be creative while making myself useful in either food, clothing or shelter. The most practical and appealing choice was architecture. If I started with life-size 3d puzzles, everything else would seem less intimidating. Where did you get the concept for your collection of convertible clothing? I designed the line around my lifestyle needs. I travel a lot, and never have to check bags because I can fit several convertible wardrobe kits in my carry-on. Also, I’m very active - I ride a bicycle nearly every day, but I can't do the sweats thing. I like to be more chic. With this outfit I'm wearing, I can easily switch it up for whatever comes next. Briefly describe your design process. My approach to design is about maximizing comfort, ease and personalization. I design clothing in the same way I approach designing a space. Architects don’t design spaces exclusively for skinny people or tall people or fat people. My clothing is one size fits all. Inclusiveness and adaptability are central themes in my design process, whether I'm designing a living space or a garment. How did you make the transition from architecture to fashion? 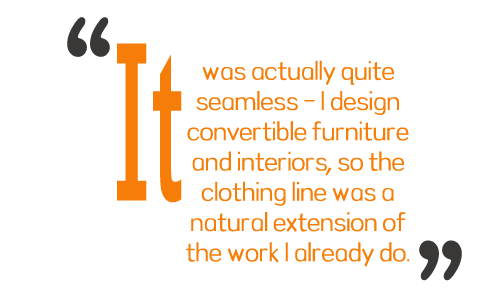 It was actually quite seamless - I design convertible furniture and interiors, so the clothing line was a natural extension of the work I already do. Regardless of what I’m designing, my goal is to identify and build upon simple and elegant solutions that solve many problems in the most efficient manner possible. For everyday stuff I love going to street fairs and indie markets all over the city. For splurges I go to A Uno or Issey Miyake in Tribeca. What’s your idea of “great style”? There's a certain level of confidence that emanates from someone who has great style. My original slogan for the beta store in Brooklyn was “Find What Works for You.” Once you identify what works for you, and do that consistently, you'll have great style. Part tomboy, part glamazon - I call it utilitarian chic. I enjoy looking fabulous, but I don’t want to spend a lot of time and energy getting there – it has to be effortless. The way I wear my hair also speaks to that notion. In the past 10 years, how has your style evolved? I’ve become a lot more discerning, in that I don't buy stuff that’s cheap and trendy that I'll have to toss after the first wash - I did that in my 20s. It’s more about quality and timelessness now. Would you consider it a priority for your fashions to be practical? Yes – It's one of the main reasons I started designing clothing. In my view, practicality goes hand in hand with comfort, style, versatility and ease of care. There are lots of designers out who think that practical simply means plain and boring, and that's what's reflected in the market. I designed my collection of compact and convertible wardrobe kits to expand what it means to design something practical. I'm not interested in doing what typical fashion designers do, nor would I be able to do it as well. Probably this guy I'm wearing right now. The Kimono Dragon is a dependable solution I can always go to, because it always fits and flatters me, and I can wear it year round. It’s become my go-to piece. Somebody could call me right now and say we’re going to an art opening, and I’d be fine. If I had to move heavy equipment or climb a ladder, I’d be fine too. It’s so convenient, and lots of fun to wear. Getting dressed each day is more like creating a sculptural installation. The flexibility of the garment provides a lot of creative freedom, and allows me to frame my body exactly as I choose. Now I spend a lot less time wondering what to wear and whether it still fits, and more time doing the things I enjoy most. In the coming months, I'll be traveling a lot more for work - doing trunks shows, wardrobe consultations, pop-up shops and in-home shopping parties. I'll also be teaming up with like-minded experts in beauty and fitness to create unique product and service packages and events, such as “Eco-chic to Go”, and “Designing Your Body Beautiful”. What's the most satisfying part about being a fashion designer? I became a fashion designer out of necessity, and the most satisfying part is that I wasn't the only one who resonated with the clothing. So many women have thanked me for designing this clothing line, and shared with me how much it has changed their lives. This, along with my own personal experience with the garments has made the entire journey extremely rewarding.